Asbestos hasn’t been used in Australia since the 1980s, and a total ban on its import and use came into effect at the end of 2003. Despite this, it was used so commonly that plenty of these notorious minerals still lie undisturbed in the structures of buildings. In most cases, asbestos doesn’t cause any problems until it’s damaged, releasing fibres into the air. When this happens, the fibres can be inhaled, where they lodge in the lungs. Over time, exposure to asbestos causes a form of cancer and several other respiratory diseases. Because it’s such a dangerous substance, getting rid of asbestos needs a lot of planning and care. If you’re renovating your home and some of the materials contain asbestos, or if you’ve just decided to clear the building of it once and for all, follow these steps to take on the job safely. Before doing anything else, you should decide whether or not you’re capable of dealing with asbestos safely on your own. If there’s anything you’re unsure about, a better option is to get someone with experience to do it on your behalf — any mistakes can be extremely dangerous. 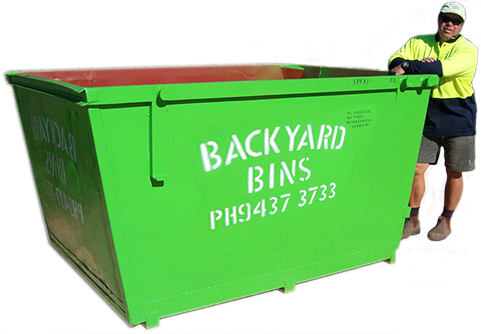 Start by choosing a spot for your asbestos bin to go, which is not a decision to take lightly. The ideal place is one where you can get from the worksite to the bin in a short distance, without having to go through many other rooms. The fewer places you’re able to tread asbestos dust, the safer. Your next step should be to decide on a date to carry out the work. Choose a time when you won’t be rushed, and make sure an asbestos bin is available for hire on that date. Give yourself plenty of time to warn your neighbours about what’s happening so they don’t endanger themselves when you get started. In addition to the tools you’ll be using, you’ll need a few other protective items. You should get hold of a water spray and plenty of water so you can wet the asbestos as you go. This stops fibres from becoming airborne. You’ll also want plenty of thick, heavy plastic sheeting. The most important equipment is your personal protective gear. You need to be completely covered in disposable clothing, so any fibres lodged in the fabric won’t stay on your regular work clothes after you finish. Choose goggles and a respirator mask that are both rated for use with asbestos, and don’t be tempted by other, cheaper options. If the label doesn’t mention asbestos, you’re putting yourself in danger. Finally, don’t just use any bin. Asbestos needs to be disposed of in a suitable container hired from a knowledgeable company who will deal with the waste safely. First, make sure all friends, family and pets are out of the building. If anyone needs to stay, they must be dressed in the proper protective clothing, even if they’re in a different room. Remind your neighbours that you’re about to start removing asbestos. Cover floors and other surfaces with your plastic sheeting, making sure there are no gaps where asbestos dust could fall through. Open the windows where you’re working, but close doors to stop it from spreading into other rooms. Continually wet the building materials as you work, as this step will drastically reduce the risk of airborne fibres. Work slowly and carefully, and don’t try to rush through it. As asbestos is removed, you need to tape it securely in plastic according to our instructions, and don’t put any other materials in the bin alongside it. Keep your respirator on until you’ve finished cleaning up, and seal all of your clothing and plastic sheeting carefully so no fibres can escape. Last of all, take a shower and wash your hair and body thoroughly. Don’t forget to scrub under the nails. If you’re ready to hire an asbestos bin, our online booking system makes it easy. And if you have any questions about asbestos disposal, we’ll be happy to help you out.